I have no idea why these shadow boxes are shown when I open the diagram. After I delete one of them the system says: "The operation has been rolled back. The model is safe." Last Edit: 3 weeks 3 days ago by henryoktober. 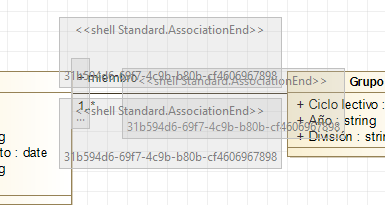 It seems that the AssociationEnd has been deleted from the model while the diagram was closed but it is strange because the Association should have been also deleted. How did you delete the AssociationEnd? The shadow box is normal. It is here to say that there was something here which have been deleted outside the diagram. But it is not normal that you cannot remove it.